SPECIALS - WHILE THEY LAST!!! AMT 1964 Chevy Impala SS Hardtop, Stock or "Super Shaker"
AMT Jim Cushman Plymouth Duster Short Track Late Model Sportsman Chrysler "Kit Car"
AMT 1923 Ford "T" Delivery Van, "The Vintage Tinsmith," "Antique Freak Boutique" or "Nestle's"
AMT 1933 Willys Panel Van Gasser "Bread Baron"
************************************************************** MODEL CAR BOXES These MODEL CAR BOXES (often referred to as "promo boxes") are custom made to our specifications. They're just the thing for storing or transporting built models and promos. 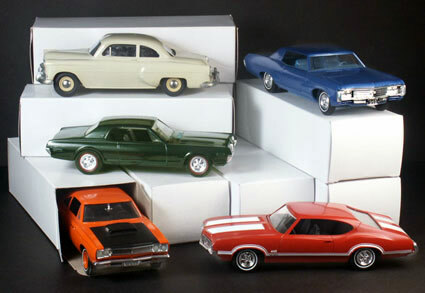 Gently wrap your model in tissue or a paper towel and slide the model into the box, and if it's a convertible, add a little clump of paper towel on the hood and trunk to prevent the windshield frame from coming in contact with the top of the box. 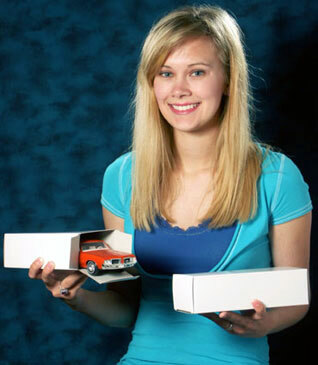 Perfect for storing and transporting model car kits and promos! 3 1/4 wide x 2 1/2 high x 8 7/8 long with secure folding end flaps! A touch wider and longer than conventional boxes for a better fit! Constructed of heavier .026 inch white chipboard material! CLICK HERE to order by the dozen. CLICK HERE to order a case of 225. 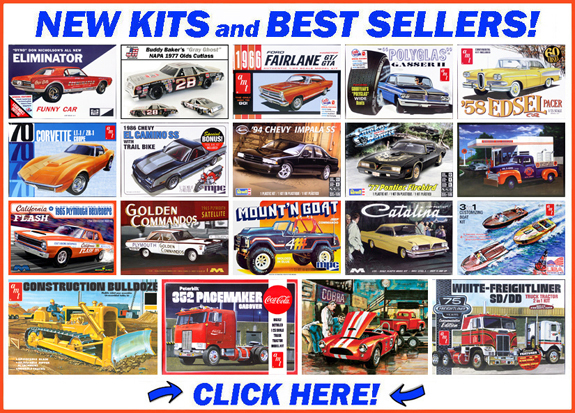 Check out our extensive selection of vintage model cars. We want you to be thrilled with your selections, and you can look forward to good old-fashioned friendly service and a lifetime of experience from Spotlight Hobbies (formerly Hobby Heaven). We've also got the hottest model car message board anywhere! Copyright � 2009 Spotlight Hobbies. All Rights Reserved.